Drive through the suburbs of Westville and residential area of Kloof . Visit a crocodile farm and a snake park situated in the magnificent Valley of 1000 Hills . 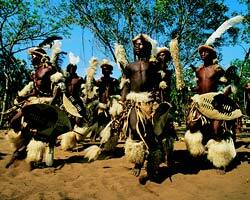 Zulu kraal which includes an informative talk about Zulu traditions and a display of tribal dancing.